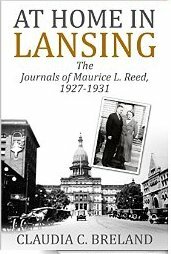 Reading At Home in Lansing: The Journals of Maurice L. Reed 1927-1931, by Claudia C. Breland, felt like sitting down for a long and lovely conversation with my grandparents, who were somewhat younger contemporaries of Maurice and Ruby Reed. I grew up in Michigan in the 1950s and ‘60s, and I don’t think I know anybody anymore who uses Michigan-isms like “forenoon” instead of “morning,” among others. My grandparents did and so does Maurice – it was delightful to hear them again. If you’re lucky enough to be related to anyone mentioned in the book, you’ll find it a double treat to know what those relatives were doing on a particular day. If you’re not related (I’m not), but have family who were in Michigan during this period between the world wars, Maurice’s diaries are a fascinating window into the daily life of the time. This kind of social history is indispensable for filling in the experiences of our ancestors and telling their stories. Reading diaries is a more immediate experience than reading or listening to someone’s recollections, because the diarist is writing about present life, rather than remembering the past. Those of us who don’t have diaries like this from family members can be glad that Maurice has recorded his world and his granddaughter Claudia Breland has shared it with us. My grandmother used to joke that she was born with wheels under her. It’s a pretty typical Michigan experience in the first half of the 20th century to own a car. Automobiles were relatively inexpensive and were manufactured nearby, gas was cheap, and roads were being improved to make auto travel easier. People would go for rides in the car as a form of entertainment. From Maurice we learn just how many things can go wrong and how much maintenance these early vehicles required, almost all of it done by himself. He also repairs an amazing range of other items used in daily life: garage doors, shoes, the furnace. He builds furniture, puts in an irrigation system for his newly-planted trees, modifies a trailer for hauling materials and camping gear. He attacks life with vigor and optimism and is a delightful guide through this world that is quite different from ours in many ways. Entertainment during this time is deeply rooted in socializing with friends, neighbors and family. Playing cards and other games, going to dance parties and costume parties hosted by friends, going for picnics and roasting weenies are common forms of entertainment, most of which my grandparents were still doing when I was a kid. Picking flowers and berries, singing and making music, going skating and to movies, plays, concerts also keep the Reeds on the go. We learn how much money Maurice spends on items ranging from nails to flour to dresses for his wife Ruby and daughter Jane. We accompany him on not one, but two, camping vacations to Yellowstone, and learn how much preparation and determination it takes to make these trips happen. When his infant son dies, Maurice makes the casket himself, loads it into the car to drive “up north” for burial in the family plot, stopping at relatives’ homes along the way so they can view the tiny body. When he arrives at the graveyard, he presents his permit to the caretaker, then digs the grave himself. This is so far removed from our own experience of death today that I had to marvel at Maurice’s fortitude. Maurice Reed is a practical, hard-working man, very interested in learning and self-improvement. His voice and personality make him an easy companion through the book, and I was sorry when it ended. I feel privileged to have been allowed access to his world. Historical background helps us understand the time and place in which our ancestors lived and what their lives would have been like. 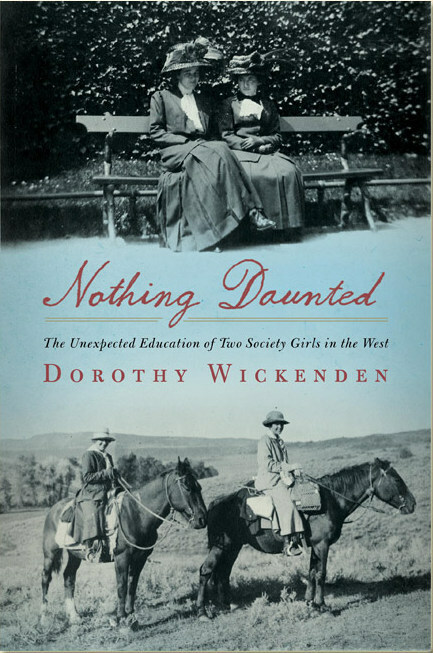 Nothing Daunted: The Unexpected Education of Two Society Girls in the West, by Dorothy Wickenden, combines a delightful read with a research story and valuable details about life in northwestern Colorado in 1916-1917. 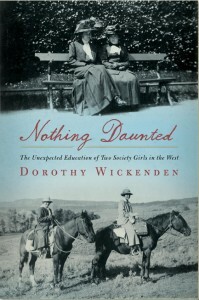 Wickenden, executive editor of The New Yorker magazine, tells the story of her grandmother, Dorothy Woodruff, and Dorothy’s best friend, Rosamund Underwood, two Smith College graduates from well-to-do families. They were 29 years old and had “done” college and a European tour — and they weren’t ready to settle for any of the young men who were courting them. Through their Smith connections, they learned that a small community in Colorado was trying to establish a school and was looking for two teachers. With lots of enthusiasm — and no teaching experience — they applied for the jobs, were accepted, and set off for the farming and ranching community of Elkhead. Their life and adventures in Elkhead during the school year of 1916-17 are fun to read about, and Wickenden takes time to tell us about the history of the area and the people who lived there, so the book provides valuable background on the area and the time. Beyond that, however, she also shares the story of her research for the book, which was inspired when she discovered the letters Dorothy had written home to her family in Auburn, New York, during that time. For anyone interested in writing a family history, this book is an exceptional resource.